Most newer refrigerators have a small plumbing line that feeds the ice maker and cold water dispenser. To keep the water and ice tasting pure, there is a replaceable water filter that should be changed regularly. How often you need to change the filter depends on the quality of your water supply and how much you use the water and ice dispensers. Most manufacturers recommend changing the filters every six months. In any case, if you feel that your water or ice does not taste as pure as it should, replacing the filter will likely solve the problem. Changing a refrigerator water filter is a quick and easy job. The best part about most of the refrigerator water filters used today is that once you unscrew the filter, it shuts off the water supply automatically. This means you don't need to worry about finding a shutoff valve to turn off the water supply to the fridge. Unless you know the brand and the precise model of your refrigerator, it is often easier to just take the filter to the local hardware or home improvement store to find a suitable replacement filter. You can also buy filters online and usually can save money by buying them in packs of two or three filters. Twist-on refrigerator water filters typically are located in the front of the refrigerator (usually behind the bottom grill) or inside the fridge near the bottom or in the upper right corner of the refrigerator compartment. Turn the filter 1/4 turn counterclockwise and pull the filter straight out of the housing. Remove the cover from the old filter and place it onto the new filter. Push the new filter straight into the housing and turn it 1/4 turn clockwise to lock it into position. 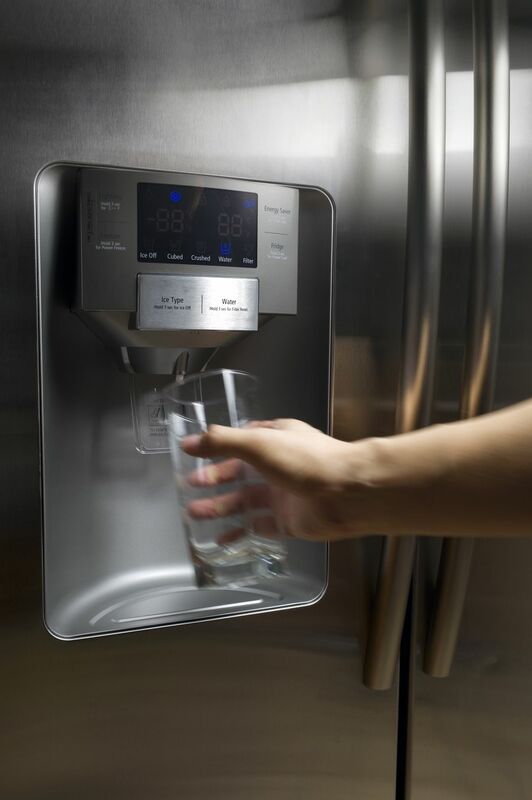 To locate a push-in-type refrigerator water filter, look behind the bottom grill in the front of the refrigerator or inside the refrigerator in one of the drawers, or in the top of the compartment toward the back. Push the button to release the filter and pull the filter out of its housing. If there is no button, push on the filter to release the spring latch holding it in place. Remove the cap from the old filter and place it onto the new filter. Insert the new filter into the filter housing, pushing it all the way in until it locks into position. Most refrigerator water filters are simple carbon filters that are filled with black carbon granules. When water first flows through a new filter, it flushes out some of the carbon, and the water have some black specks in it or an overall gray color. This is not harmful to drink, but you probably don't want a glass of gray water or ice with black spots. To flush a new filter, run a gallon or two from the water dispenser, collecting the water in a pitcher. Discard the water or use it to water your plants. If you only have an ice maker in the refrigerator, you may have to throw away the first few batches of ice if they are discolored.